As our ship approaches the massive, semi-circular remains of the volcanic crater of Santoríni, the chalk-white buildings gripping the lid of the famous island come into sharper view. Sailboats rest in the windshield of nearby islets, rocky black clumps that hint at what remains from one of the largest volcanic eruptions in human history. Our cruise ship, the Celestyal Olympia, slows to a stop as tender boats gather to ferry us to port. As soon as we land, our bus snakes up the steep hillside and whisks us to Oia, the picturesque village on the island’s northern tip. Its oft-photographed, blue-domed churches and stunning views of sunset over the caldera draw legions of visitors. As we watch the sun sink, igniting the caldera’s layer cake with orange and pink hues, it’s easy to see why. Santoríni is perhaps the best known of Greece’s 100 permanently inhabited islands scattered in the Aegean and Ionian seas. These places sit at the crossroads of thousands of years of history, much of it contentious as Turks, Romans and Egyptians fought over the region. 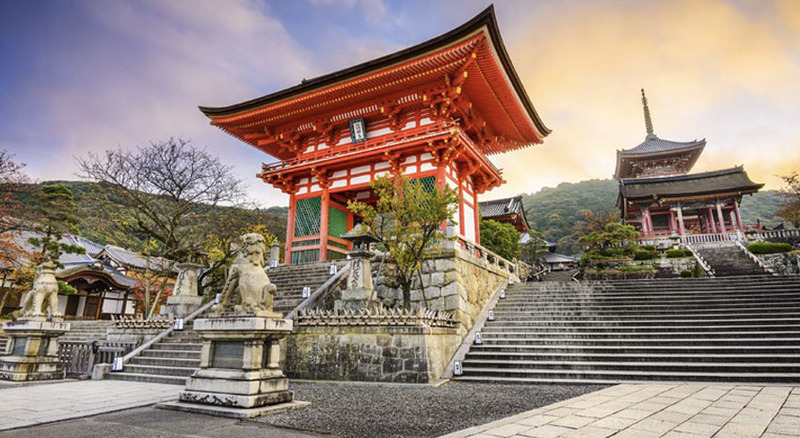 Often that history exists alongside modern restaurants and luxury hotels, high-end shopping and yacht-filled marinas. One sees more prevalent signs of Greece’s recent economic struggles in Athens than on the islands, which feel worlds away from the strife and unrest of the big city. Though Greece has been in a recession since 2008, the islands fared well for the purposes of a short visit. And they’re well-equipped to handle the millions of visitors who disembark on their idyllic shores yearly. Cruising remains a popular way to visit the islands. Trips take place from April to October, with July through September the most prevalent sailing months. Cruise operators range from familiar names like Holland America Line and Princess Cruises to smaller, independent yachting companies like Setsail and Tasemaro Sailing. Both larger ships carrying more than 1,000 passengers and low-key yacht operators taking smaller groups to less visited destinations can be found along the shores. 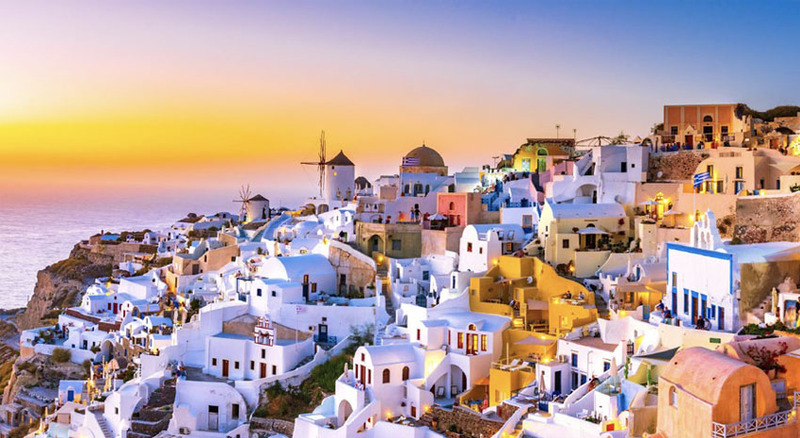 The islands are grouped by region, with the Cyclades in the central Aegean and the Dodecanese in the southeast near Turkey among the more popular destinations. 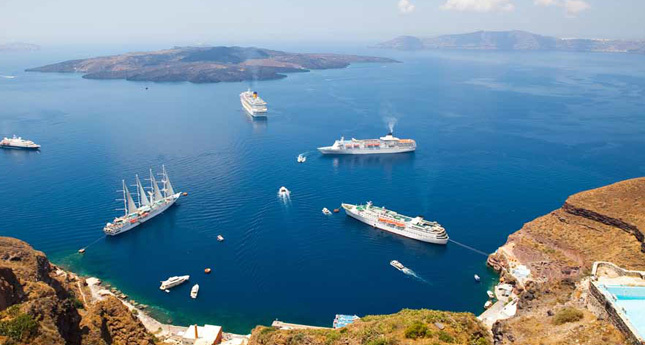 Most itineraries include Santoríni and Mykonos, the jewels of the Cyclades. In Santoríni, the majority of visitors head to Oia village for impressive views. History resides here, too, at sites like Akrotiri, an ancient Minoan city once buried under volcanic ash. Quiet Sikinos, near Santoríni, maintains a traditional island life and holds commercialism at bay. Visit charming Kastro, sample wine at the Manalis Wine Factory and explore the dramatic beach of Agios Nikolaos. On glamorous Mykonos, a popular haunt of the rich and famous worldwide, don’t miss a trip to the so-called Little Venice, where pastel-hued buildings meet the sea. Stroll through the alleys of Hora, the island’s port and capital, and see and be seen at a seaside bar or relax on a low-key beach. Naxos, the Cyclades’ largest island, combines a bustling city center with quiet beaches, small villages and ancient sites. Stop in the Vallindras Distillery, which offers free tours and tastings. Visitors should also see the kouroi — giant, ancient stone figures — in the Melanes Valley. The Dodecanese feel remote — after all, leaving from Piraeus, you crossed the entire Aegean to get here. The islands overflow with history, from Byzantine to Ottoman to Italian imprints, with Ancient Greece close at hand, too. The largest island in this collection is Rhodes, which offers a little bit of everything. You’ll disembark near Rhodes’ Old Town, with its cobbled streets winding through its Byzantine fortress; many of these streets sport modern restaurants, cafés and shops — far more than you can visit in a day. The ancient Colossus once stood at the port, straddling the entrance to the harbor. The white, cliff-hugging dwellings of Lindos, a small town on Rhodes’ east coast, remains a popular stop for its ancient Acropolis, reachable via a meandering climb through the streets of town. The island of Kos boasts some of the most impressive collections of ruins in the Aegean. Here you’ll find the Asklepion (Hippocrates’ ancient sanatorium), the Castle of the Knights and numerous other ancient sites. Quaint mountain villages like Zipari, Asfendiou, Zia and Pyli beckon explorers, as do a slew of beaches scattered around the island. Samos Island, the mythical birthplace of Hera and the historical birthplace of Epicurus and Pythagoras, contains the ruins of Hera’s sanctuary, the impressive Heraion, along with the Evpalinos Tunnel, built in 524 B.C. and burrowing 3,392 feet underground. The free Samos Wine Museum offers tours and tastings. Low-key Patmos is famous for its Cave of the Apocalypse, where Saint John is said to have received the visions transcribed into the Book of Revelations. Visitors can step into the cave as well as tour the next-door Monastery of Saint John the Theologian. Crete, the largest of the Greek islands, remains a popular stop for its Palace of Knossos, the capital of Minoan Crete dating to 1900 B.C. The bustling town of Heraklion leaves something to be desired, though it’s worth stopping in at the Archaeological Museum, one of the best in the country. Because most cruises start and end at Athens’ port, Piraeus, it’s best to book your plane tickets through the Greek capital. 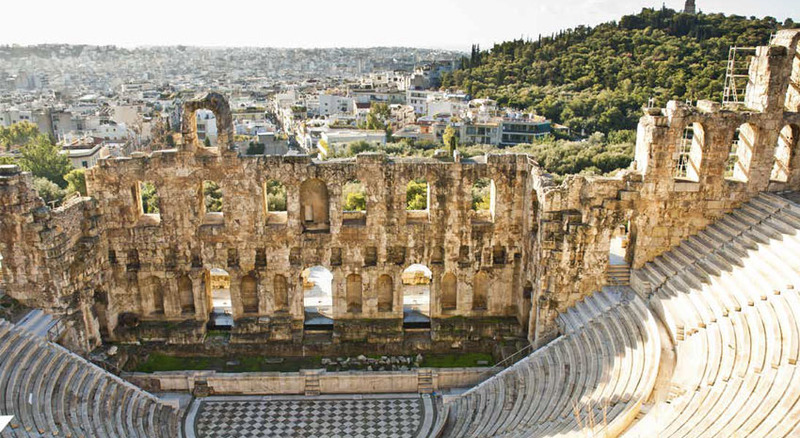 Fly non-stop to Athens International Airport from New York’s John F. Kennedy International Airport or Philadelphia International Airport; otherwise, connect at a wide array of European airports. Numerous private ground transportation companies ferry visitors from the airport in Athens to Piraeus, as do taxis, which are abundant.